Electrosensitivity doesn’t just cause identifiable medical symptoms. It affects and often limits all aspects of people’s lives—shopping, employment, housing, friendships and more. Laurie Corbeil has worked as a cleaning person in private homes and industrial settings for most of her life. But now, due to her electrosensitivity, she works just two days a week for one client who allows her to shut off all wireless devices while she is there. “If not for this, I wouldn’t have any job. I am very concerned that when the smart grid is fully operational, I will not be able to work or even remain in the city,” says Laurie, referring to BC Hydro’s installation of smart meters across the province, a program expected to be complete by December 2013. “I have an 81-year-old mom to take care of. What will become of us?” she asks. Laurie developed Multiple Chemical Sensitivity (MCS) twenty years ago as a result of her exposure to chlorine and other cleaning agents while at work. And that condition has made her more susceptible to becoming electrosensitive. Case studies show that people with MCS, or other chronic burdens on the immune system, are far more likely to develop electrosensitivity. The Environmental Health Centre in Dallas, Texas reports that, of 500 patients treated for MCS, as many as 80 percent of them also have electrical sensitivities. Coffee shops, doctors’ offices and even Laurie’s own church are now off-limits to her because of wi-fi, cell phones, tablets and other wireless devices. If every cloud has its silver lining, then for Laurie that lining consists of discovering the healing and protective power of forests. 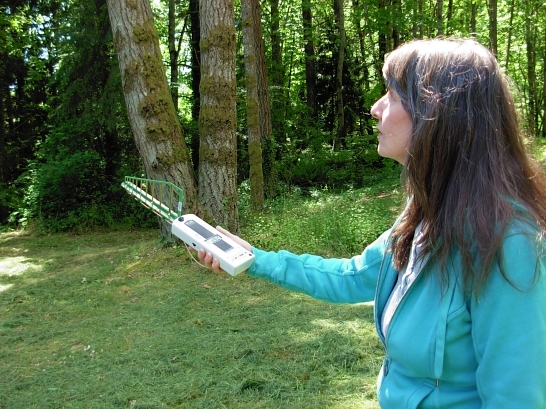 Laurie spends at least an hour every day in one of Nanaimo’s forested parks. She says the best local parks for relief from EHS symptoms are Colliery Dam Park, Hemer Park and Morrell Nature Sanctuary. Each site offers a sizable forest of mature Douglas fir, Western Redcedar and Bigleaf Maple. And each site has a system of lakes and waterways, generating a protective field of negative ions. 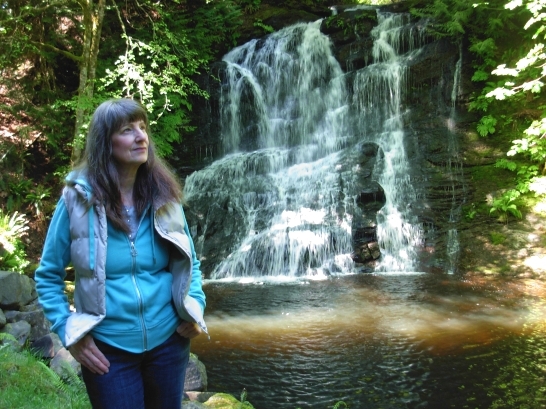 At Colliery Dam Park, Laurie finishes her outing with a grounding session at a pool located at the base of a spillway in the bottom of a lush ravine. She sits on her favourite rock, kicks off her shoes, slides her bare feet into the water and rests them on a large underwater boulder for 30 minutes while misted from the spray of the spillway. Then she scrambles back up the slope to return to her car in the parking lot, and to the world of invisible wireless radiation beyond. 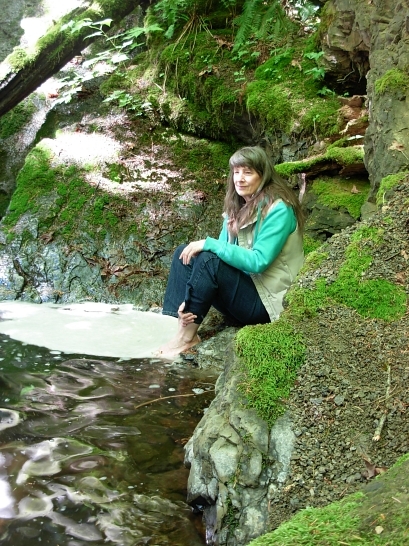 This entry was posted in EHS Stories, Nature and tagged Colliery Dam Park, forests, healing power of nature, Hemer Provincial Park, Laurie Corbeil, Morrell Nature Sanctuary, Multiple Chemical Sensitivity, Nanaimo, Vancouver Island on May 26, 2013 by Kim Goldberg. It’s so important for us to hear stories like these. They will become more relevant to more of us all the time. Keep them coming! Thank you for sharing information to help others. I too suffered horribly for many years from MCS, EI, CFS, depression and multiple food allergies to name just a few of my diagnoses. Avoidance was my initial and ongoing approach for years while I researched everything I could about all of my conditions – which all started after moving into a new home, that was in 1995.. I can eat out in any restaurant or home and eat all foods without reactions. I can enter and stay in any room, building or anywhere without skewed responses. 1. Continue becoming educated and avoid triggers. This will allow your body time to stop hyper vigilance and reacting and concentrate it’s energies on repair and healing. 2. Utilize strategies to reprogram your brain and body to stop mounting skewed, excessive and unwanted responses. This may require a paradigm shift in thinking. I have been able to duplicate my ‘symptom free’ status with clients. I share my protocol in my book THE WHOLE PERSON WELL-BEING EQUATION which is now available globally on Amazon. MCS sufferers can become 100% symptom free. !